The widest of the Phoenix Flavia towel rail range have higher heat outputs than the narrower models and are available in 4 convenient heights ranging from 800 to 1800mm. These radiators simply need wall mounting and connecting to an electrical point by an electrician, no plumbing is required. 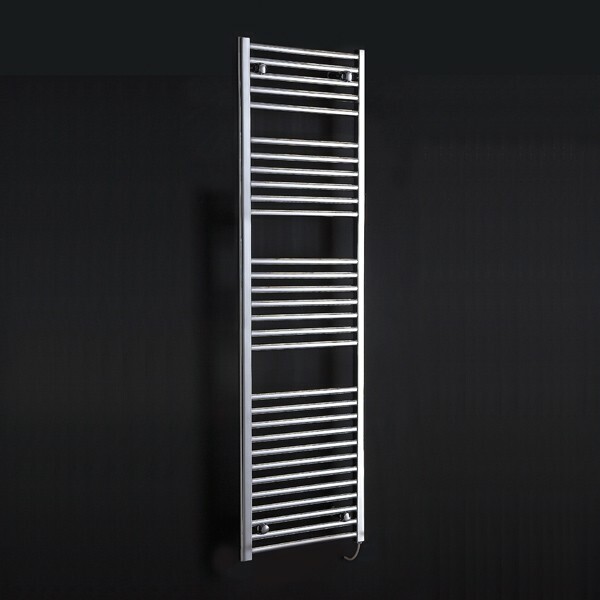 The Flavia pre-filled electric only towel rail is perfect for fitting into a room that has no plumbing or where fitting gas fired central heating isn't possible. It will warm a bathroom or dry towels with the minimum of fuss all year round. The 19mm rails are finished in a high quality chrome finish designed to look good for years. The correct wattage of heating element is pre-fitted based on the size you choose. Study the technical diagrams to ensure the correct sizing for your bathing space. Please note the product image shown is of the 500mm wide model (1800mm height, 30 rails), this product page is for purchasing the wider 600mm models.